Debony Salon Has a New Look! Debony Salon is going on twelve years old and over those years the salon has grown and nestled into it’s place in the community. Starting out as a one woman show in the white house on 16A, Debony created a sanctuary for all of her clients. Creating an eclectic space filled with unique art, antiques and fun and funky interior design, her salon was not only a place to get your hair done, but a place to relax and have fun with friends. Over the years, Debony Salon grew from just Debony behind the chair. Moving just over the bridge on Route 16B, the salon is now home to six Cosmetologists, two Massage Therapists and one Esthetician. Those commitments can be seen through Debony Salon’s logo. For the past few years, the salon has been represented by a golden star. 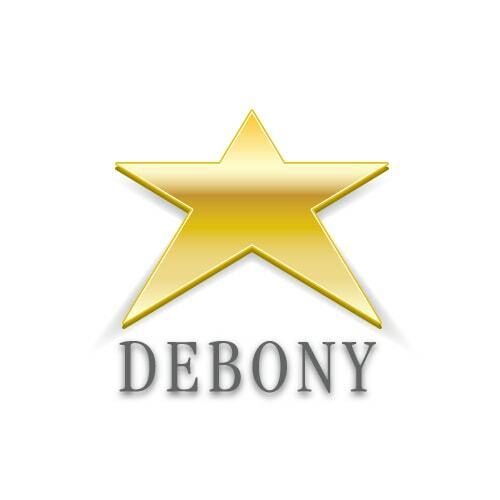 A star is important to Debony, because as a society, we associate quality with a star. We, as a culture, rank things on a five star spectrum, and, when Debony Salon is providing a service, it wants to go above and beyond – in a way, it wants to reach for the stars – in the quality it provides you with. And if you’ve been paying close attention, Debony Salon, in both locations, has always had an “Asian Jute Gold” colored wall! updated star. 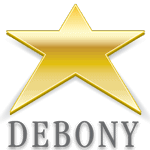 While our look is becoming a bit more clean and crisp, our commitment to our mission statement is unwavering, we hope the story behind the Debony Salon star means as much to you as it does to us! We’re so excited to unveil this new logo and share a bit of the meaning behind it. What do you think of the new logo? !